These photographs were found with other copied prints in the John Cleland Community Archive. The original photographer is unknown - these have been labelled (at a later date by Ian Matheson) Rangiotu Camp, 1915 based on the information found on the photographs. The rectangular building in the distance on the right was the HQ of the camp. The farmhouse in front belonged to Manawaroa Te Awe Awe, the man who loaned the use of his paddocks for the camp's creation. The house was later moved closer towards the other houses visible in the distance on the left side of the image. 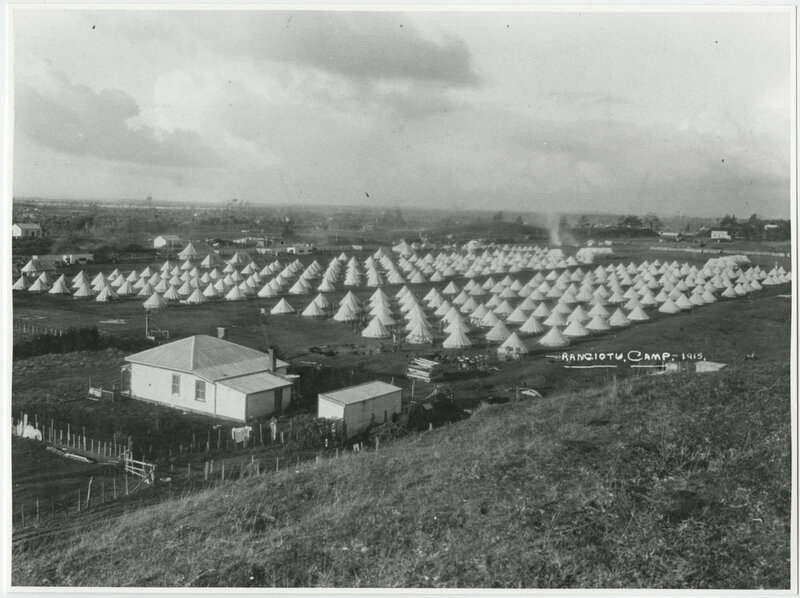 The camp was built to house the men evacuated from Trentham Camp (Wellington) due to unsanitary conditions and disease. Samuel Jickell, Civil Engineer for the Palmerston North Borough Council, used the information from a report on the failings of Trentham's design to ensure similar problems did not arise in Rangiotu. Tthe 1st & 2nd New Zealand Rifle Brigade and the Earl of Liverpool’s Own Regiment were stationed at the camp, which was comprised of over 3000 acres and could accommodate 2,000 men.